Keeping your body at peak performance not only aids in higher running achievement but also enhances your enjoyment of the sport. Runner compression socks are a useful tool toward achieving and maintaining your peak performance. But don't think that compression socks can't also be fun. 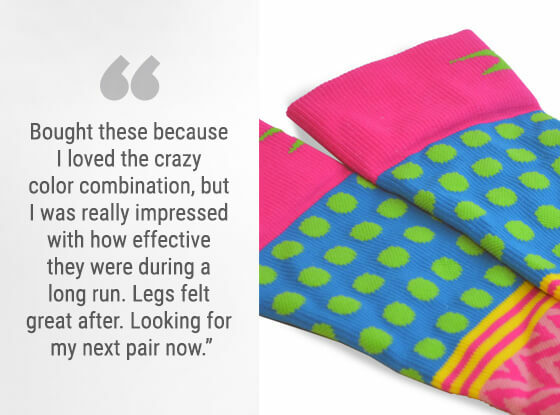 These brightly colored, printed compression socks from Gone For a Run deliver top health benefits for runners with eye-catching style. Designed by Run Technology®, these moisture-wicking socks feature true graduated leg compression. They are constructed to fit properly and comfortably to assist you while running and aid in post run recovery. The knee-high length protects lower legs from dirt and scratches and allows you to wear shorts a bit longer in the fall as the weather gets cooler. How do compression socks help runners? These knee-high performance socks improve blood flow. Improved blood flow while running translates to less muscle soreness because more oxygen reaching your muscles means better lactic acid removal. As an added benefit, well-oxygenated muscles perform better. Exercise-induced swelling in your lower legs can also be reduced when you wear compression socks. All of this means better running performance and a less-painful and shorter recovery. The moisture-wicking property of these socks also protects the health of your feet. Moisture-wicking material works by pulling moisture away from your skin to the outer layers of the sock material. With less moisture comes less blistering and less odor. Less blistering means more running and less recovery time. Go wild with many vibrantly colored and fun compression sock patterns. Polka dots, stripes, polka dots combined with stripes, smiley faces and lightning bolts are all available. You'll also find fun sayings such as “Run Now Wine Later” as well as our runner girl collection. Check out how you can show your love for beer or camouflage with these fun socks. You're sure to find a favorite in our selection. Check the helpful sizing chart for your perfect fit. You will find ample size options for men's runner compression socks as well as for women's runner compression socks. Reap the benefits of supporting your legs in style, or give a pair as a thoughtful, stylish gift for a runner.